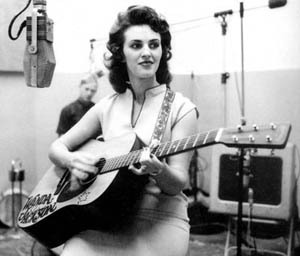 Wanda Jackson has the best growl I have ever heard, ever. She has a career as a split Gospel/Rockabilly artist. How cool is that? I don't know a lot about her history, or about her struggles in the music industry - I do know that though she is called 'the girl elvis' a bunch, she was famous before they met and he was pretty unknown! I do think he inspired her to get a little wilder & more daring in her singing, so thanks elvis! She was/is more popular as a Gospel singer - and had to put her rock tunes out as B-sides to the Gospel & Country hits. Recommended: the easiest record to get, and a really good collection of her work is the Vintage Collections CD. I wish I could afford the boxed sets (there are two, one with 4-5 CD's and one with like 10) and if you've got cash, get those!! The VC includes totally rock songs ("Riot in Cell Block #9" with genders reversed) and sweet love songs that aren't as cheesy as most of the pop love songs of that era. I think she could easily bring you ladies who think you hate country over! This one isn't about Gospel, so if that's your thing, check out her website for other available CD's.